3?4 cup gorgonzola picante (look for a stronger, firmer gorgonzola, instead of the very soft gorgonzola dolce), chopped into medium size hunks. 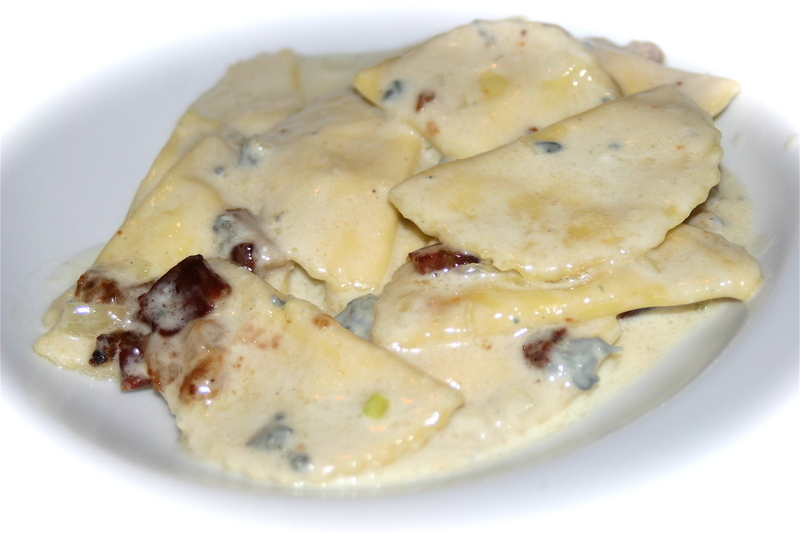 If you are feeling inspired, and have some great fresh pears around, make the ravioli yourself. If you don’t have the time or inclination or skills, use a good quality ricotta ravioli, and double the amount of pear used in the sauce. Fresh ravioli filling: 200g of sheep ricotta and one very ripe pear. Using a stick blender or food processor, blend the ingredients well. You should have a ‘fluffy’, soft filling that is suitable for piping onto the ravioli. You don’t want it too runny, if your pears are super juicy, increase the amount of ricotta that you use. Store the ravioli in the freeze until you are ready to use them. Prepare all the sauce ingredients. While the pasta water is coming to a boil, make a green salad. It’s good to have something chewy and crunch after this pasta. When the water is just about ready, using a saucepan that is big enough to hold the ravioli, melt the butter and add the onion. You want to soften the onions, not brown them, so pay attention here! Using a whisk, slowly add the cream and allow it to heat up. In another pan, oh, quit worrying about doing the dishes, it’s worth it, I promise. As I was saying, in another pan, saut? the pancetta/lardon/bacon. My pancetta is very lean so I need to add a few drops of olive oil to keep the pan from scorching. Use your judgement here. At this point, it’s no longer possible to answer the phone, you need to stay focused. When the cream/onion mixture is warm and almost at the boil point, add the gorgonzola and start to gently whisk it around. You want the gorgonzola to melt, but be careful not to let it boil too much. 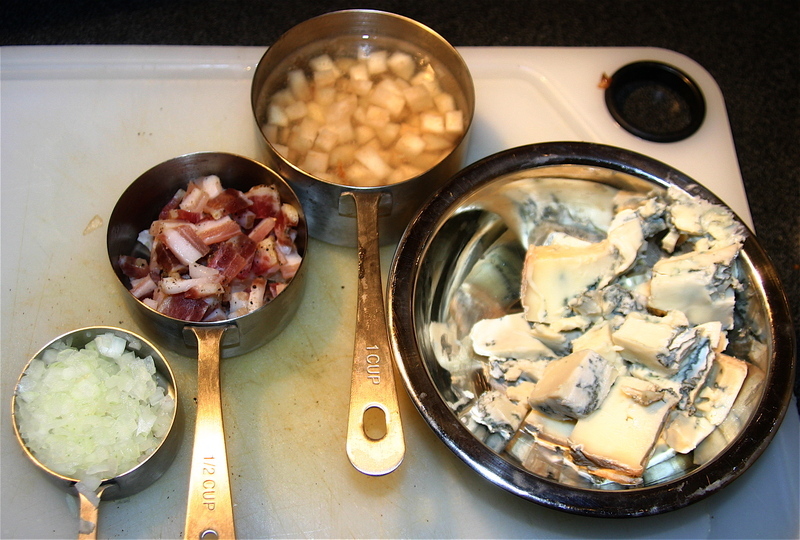 By now the pancetta is crispy, the gorgonzola is mostly melted, the ravioli are almost done, its time to add the pears to the pancetta and stir them to brown evenly. Serve it with an assertive white wine, nothing too shy, the wine should be crisp with a only the touch of sweetness. It would also be good with a light bodied red wine. I served it with a 2004 Corvo “Rosa”, a rose from Sicily.